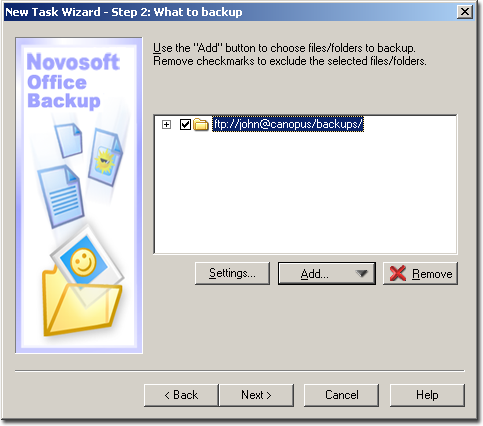 To add files to the backup set, you need to create Backup task. 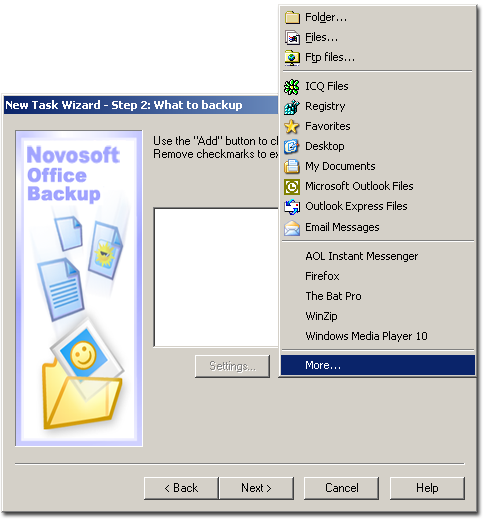 In Step 2 of the Backup Task Wizard: What to back up, click the Add button. A list of file categories will launch. If you click Folder..., the Browse for Folder window will launch. 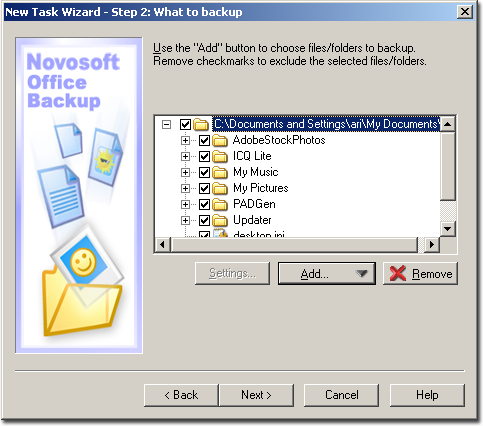 Select which folder/-s you want to back up and click OK to add data to the backup set. 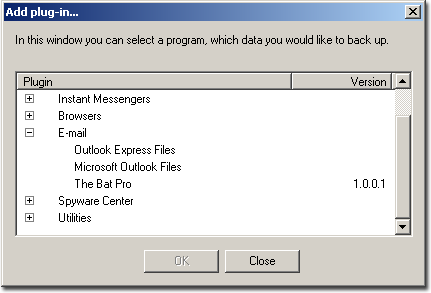 As soon as you have selected some data, you will see these data added in the View Box of the What to backup window. 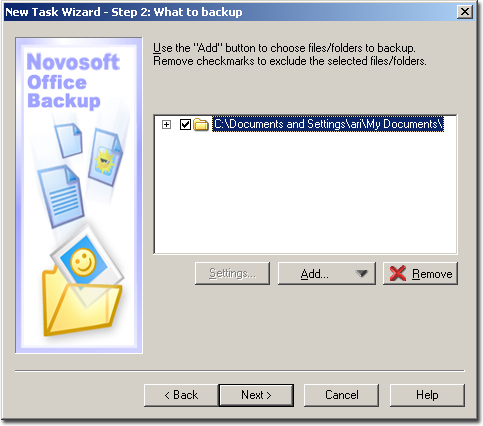 This means that these data have been added to the backup set and will be backed up as soon as you create the backup task and launch it. 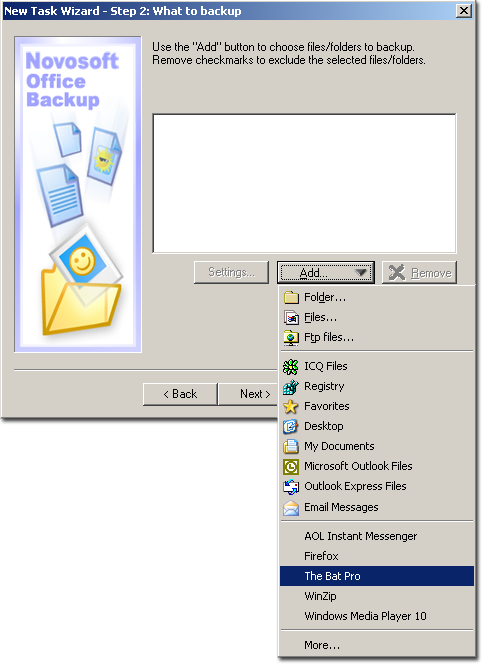 In the picture above, you can see that My Documents folder has been added to the backup set. If you click "plus" next to My Documents, you will see which folders it contains. You can click "plus" next to each folder to view its contents. In the picture above, you can see the contents of the My Pictures folder. If you remove checkmarks next to files and folders, you will exclude those files and folders from the backup set. To hide the contents of a folder, click "minus" next to this folder. If you want to delete all selected files, use the Remove button. 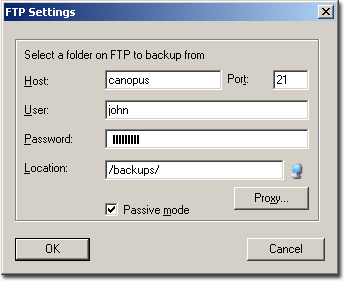 The FTP files item of the Add list allows you to include files stored on the FTP server to the backup set. If you click FTP files..., the FTP Settings dialog will launch. Enter your settings such as Host, User, and Password. Then, click the icon to connect to the FTP server. 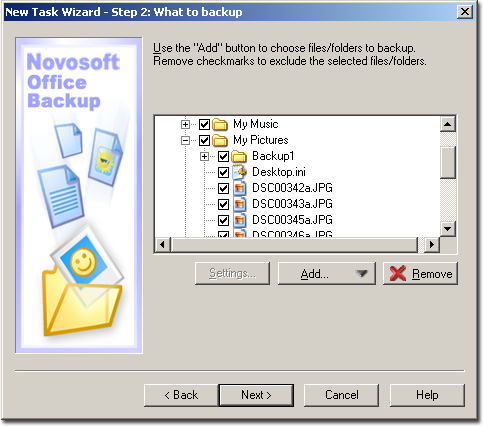 Choose a folder whose data you wish to back up and click the Select tab. This remote location will be added to the Location field. Click OK to add the remote FTP location to the backup set. Click the Settings tab to see or change the settings of the FTP connection. To get more data click the More... item on the Add list. The Add plug-in window will launch. In the Add plug-in window, you can see and add plug-ins from a data category by clicking "plus" next to a category. E.g. If you want to add data from The Bat! email client, click "plus" next to the E-mail category. Select The Bat Pro from the list. Click OK. The Bat Pro! will be displayed in the Add list. If you click The Bat Pro! on the Add... list, the data associated with this application will be added to the backup set.